Download "Chapter 4 & 5 practice set. The actual exam is not multiple choice nor does it contain like questions." 1 Chapter 4 & 5 practice set. The actual exam is not multiple choice nor does it contain like questions. MULTIPLE CHOICE. Choose the one alternative that best completes the statement or answers the question. 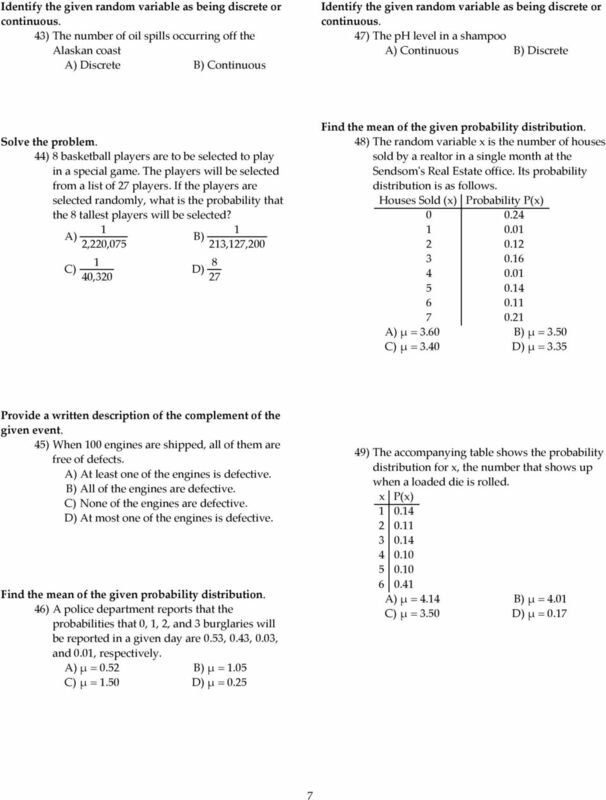 Express the indicated degree of likelihood as a probability value. ) ʺThere is a 40% chance of rain tomorrow.ʺ A) 0.40 B) 0.60 C) 40 D) 4 2) ʺIt will definitely turn dark tonight.ʺ A) B) 0.5 C) 0.30 D) 0.67 Answer the question. 3) Which of the following cannot be a probability? 7) Refer to the table which summarizes the results of testing for a certain disease. Positive Test Subject has the disease 89 Subject does not have the disease 26 If one of the results is randomly selected, what is the probability that it is a false positive (test indicates the person has the disease when in fact they donʹt)? 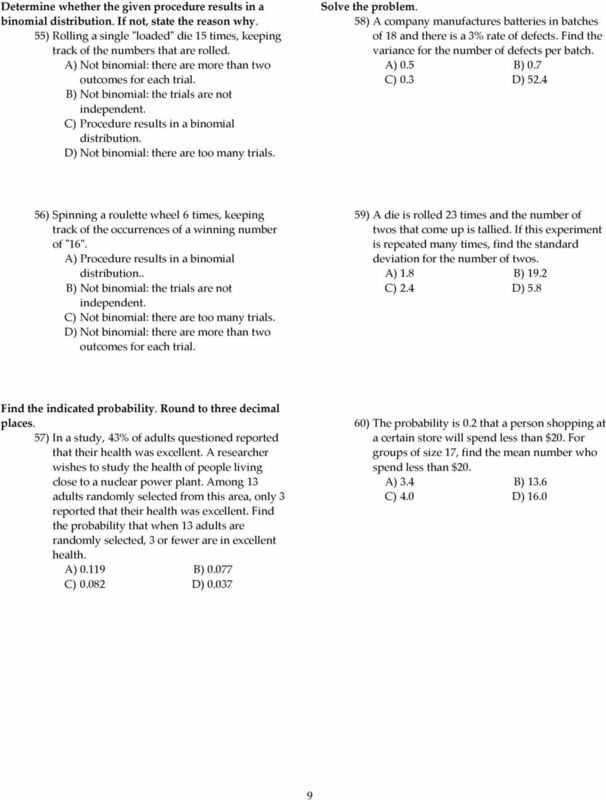 What does this probability suggest about the accuracy of the test? A) ; The probability of this error is high so the test is not very accurate. B) ; The probability of this error is low so the test is fairly accurate. C) 0.46; The probability of this error is high so the test is not very accurate. D) 0.42; The probability of this error is high so the test is not very accurate. 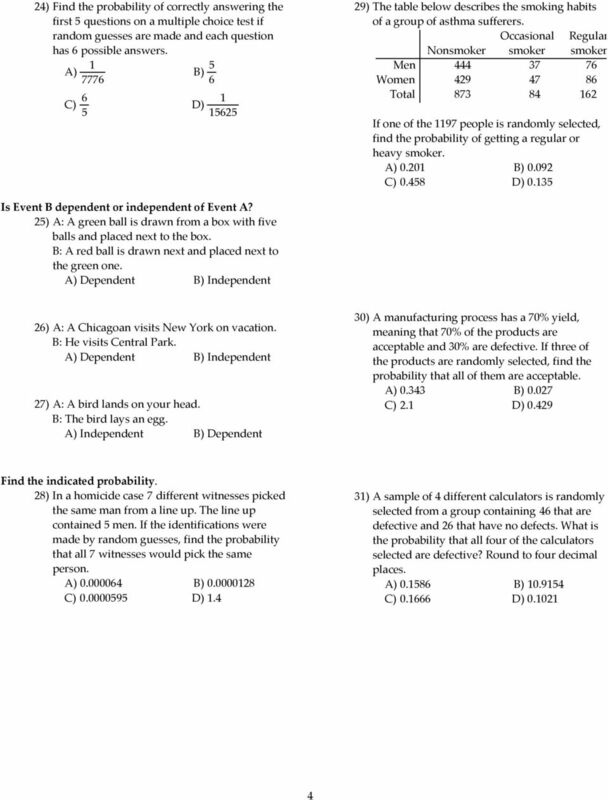 A) 5 3 B) 2 3 C) 2 D) 3 5 4) What is the probability of an event that is certain to occur? 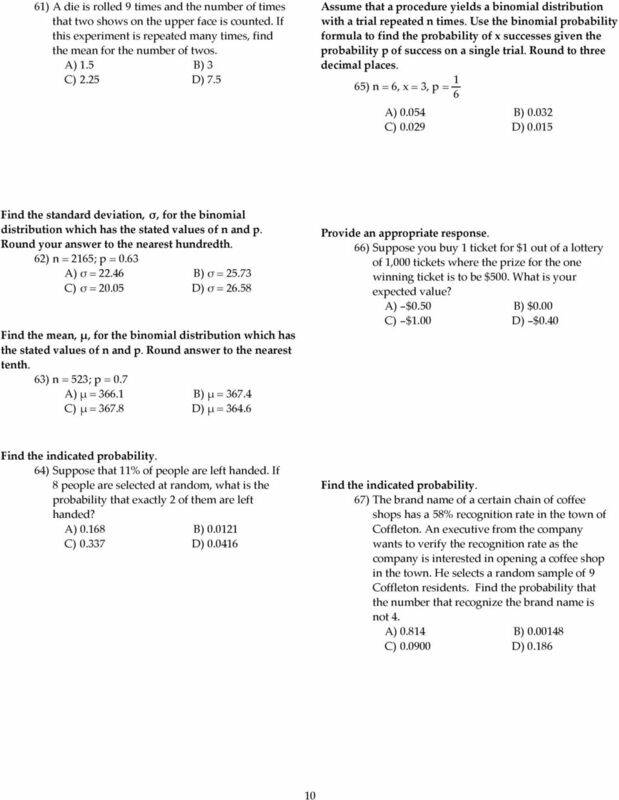 A) B) 0.95 C) 0.99 D) 0.5 5) On a multiple choice test with four possible answers for each question, what is the probability of answering a question correctly if you make a random guess? A) 4 B) 3 4 C) 2 D) 8) Two 6-sided dice are rolled. What is the probability that the sum of the two numbers on the dice will be 4? A) 2 C) 2 B) 2 3 D) 3 Answer the question, considering an event to be ʺunusualʺ if its probability is less than or equal to ) Is it ʺunusualʺ to get 4 when a pair of dice is rolled? 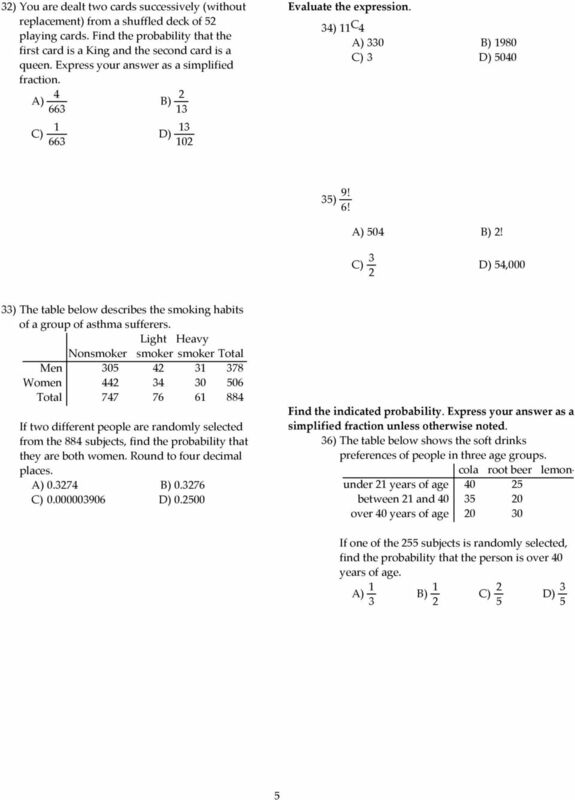 Find the indicated probability. 1) If a single fair die is rolled, find the probability of a 4 given that the number rolled is odd. Determine the empirical probability that a person selected at random from the 1000 surveyed uses Mastercard. Name Please Print MULTIPLE CHOICE. Choose the one alternative that best completes the statement or answers the question. 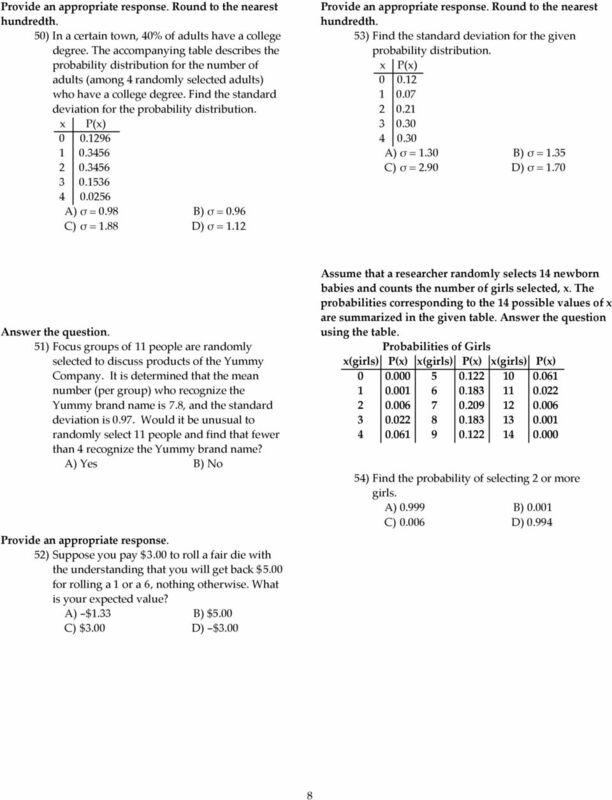 Probability --QUESTIONS-- Principles of Math - Probability Practice Exam www.math.com Principles of Math : Probability Practice Exam Use this sheet to record your answers:... 4... 4... 4.. 6. 4.. 6. 7.. Exam Name MULTIPLE CHOICE. Choose the one alternative that best completes the statement or answers the question. Provide an appropriate response. 1) State whether the variable is discrete or continuous. 2. How many ways can the letters in PHOENIX be rearranged? 7! = 5,040 ways. A probability experiment is a chance process that leads to well-defined outcomes. 3) What is the difference between an outcome and an event? Math 118 Study Guide. This study guide is for practice only. The actual question on the final exam may be different. MULTIPLE CHOICE. Choose the one alternative that best completes the statement or answers the question. C) (a) 2. (b) 1.5. (c) 0.5-2. Chapter 3 Probability Every Day, each us makes decisions based on uncertainty. Should you buy an extended warranty for your new DVD player? It depends on the likelihood that it will fail during the warranty. The Big Picture of Statistics Chapter 4 Probability Section 4-2: Fundamentals Section 4-3: Addition Rule Sections 4-4, 4-5: Multiplication Rule Section 4-7: Counting (next time) 2 What is probability? Math 210. 1. Compute C(1000,2) (a) 499500. (b) 1000000. (c) 2. (d) 999000. (e) None of the above. Prestatistics Review #3 Find the square root. 1) 144 A) 72 B) -12 C) 12 D) Not a real number 2) - 625 A) -312 B) 25 C) -25 D) Not a real number 3) 0.25 A) 0.005 B) 0.05 C) 5 D) 0.5 Find the cube root. MULTIPLE CHOICE. Choose the one alternative that best completes the statement or answers the question. A) 0.4987 B) 0.9987 C) 0.0010 D) 0. The practice test follows this cover sheet. It is very similar to the real Chapter Test. number of favorable outcomes total number of outcomes number of times event E occurred number of times the experiment was performed. 12 Probability 12.1 Basic Concepts Start with some Definitions: Experiment: Any observation of measurement of a random phenomenon is an experiment. Outcomes: Any result of an experiment is called an outcome.